This manual contains a procedure for the organization of studies of the numbers and population structure of amphibians in spring and summer. The method of selecting habitats for study, the technique for a route census of frogs, the procedure for the simplest measurements of caught animals and the analysis of the age structure of frog populations found in different biotopes are described. If we look at the history and culture of humankind, amphibians as well as reptiles have always aroused a feeling of suspicious interest and some superstitious fear. In fairy tales and legends of many peoples of the world, they were the prototypes of dark forces, evil and danger. Despite all of these superstitions, amphibians are very sensitive, interesting and unusual animals. Amphibia is the first and most primitive class of terrestrial vertebrates. Their fish-like progenitors appeared on Earth in the Devonian period (about 350 million years ago). In spite of long-term evolution, amphibians kept a number of primitive features, which they inherited from their ancestors. Most modern amphibians (which are divided into three orders – Apoda, Caudata and Anura, with a total of 4500 species) are closely connected to life in the course of their life cycle. They deposit their spawn (eggs) in water, where development of embryos and larvae takes place. Mature amphibians (most species) spend most of their life on land. Such a “double” life, i.e. 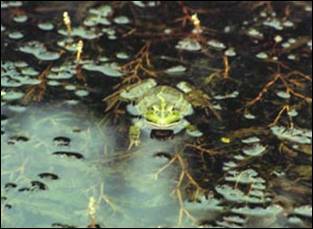 life in two types of habitats, aquatic and terrestrial, is reflected in the Latin name of these animals (Amphibia). Unlike other vertebrates, the skin of Amphibia is smooth – there are no scales, feathers or hair; it is often moist to touch due to numerous glands. A diversity of amphibians is not found in the northern and temperate climatic zones of the Earth (most of them are found in the lower, tropical latitudes). Thus, a number of species found in a specific area does not exceed five to eight for the majority of the Russian territory. The reason for this is the poikilothermy of amphibians, i.e. the inconstancy of their body temperature, which greatly depends on the temperature of their environment. The cold climate of temperate and northern latitudes results in the fact that not many amphibian species can exist there. That is why it is so interesting to study amphibians under severe conditions that are almost unsuitable for the existence of cold-blooded animals. In addition, the low species diversity of amphibians makes the educational study of these species easier. Besides, these species are not as active and cautious as other invertebrates, and they can be caught easily in order to examine them more closely: to measure and weigh them. All these factors greatly contribute to the possibilities of their study by students. The study is aimed at an amphibian census carried out within the vicinities of the school or field studies center. Students catch amphibians and analyze the size and age structure of their populations in different biotopes of the surrounding area in the course of conducting the studies. The most favorable period for the given study is the end of spring and the beginning of summer, i.e. the period of highest activity for amphibians, their breeding and migrations. Students will use the following equipment in the course of their studies: containers for catching frogs (buckets), rulers (slide gauge) for measurements, a laboratory balance, field diaries and calculators. At the preparation stage, students should learn about the expected composition of amphibian species within the specific area and proposed procedures for studies. In order to do this, it is necessary to make a list of amphibian species in the area using available atlases, manuals and field guides. Students should also recollect the general rules for route census, which were taught in previous lessons of the given series (census of fungi: Lesson #6, fall; bird census: Lesson # 7, fall). As the research is aimed at studying the species composition, numbers and age structure of amphibian populations in different biotopes, so it is recommended to begin by making a list of biotopes under study – as it is done during all studies within the given series on carrying out research on the habitat variability of specific indicators (Lessons #6, #7, # 10 fall; Lesson#5 winter, Lessons #2, #3, #4, # 10 spring, Lessons #5, #9 summer).